EVERYTHING YOU NEED TO HELP SCORE A PERFECT 800. 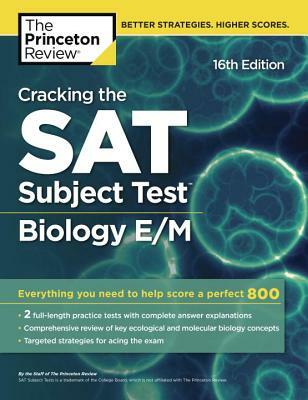 Equip yourself to ace the SAT Subject Test in Biology with The Princeton Review's comprehensive study guide—including 2 full-length practice tests, thorough reviews of key biology topics, and targeted strategies for every question type. Bio can be a tough subject to get a good handle on—and scoring well on the SAT Subject Test isn't easy to do. Written by the experts at The Princeton Review, Cracking the SAT Subject Test in Biology E/M arms you to take on the exam with all the help you need to get the score you want.